Jaguar Land Rover and Waymo recently announced a strategic partnership to supply the Alphabet-owned self-driving technology company with up to 20,000 examples of the new all-electric I-Pace crossover over the next 2 years. 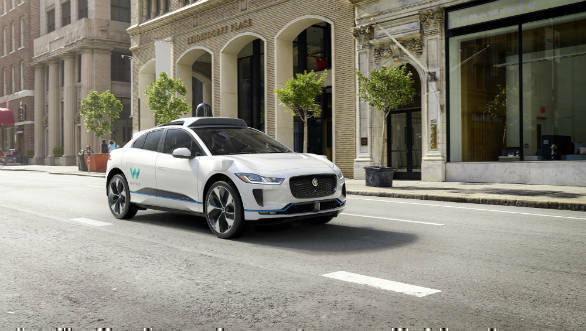 Jaguar Land Rover and Waymo (formerly Google's self-driving car project) will work together to design and engineer self-driving Jaguar I-Pace vehicles starting later this year. The Jaguar I-Pace, which debuted earlier this month, comes with a 90kWh battery pack which lets it put out 400PS and 696Nm while having a 480km range. It gets a bespoke aluminium platform and gets Jaguar's own battery technology, getting from 0 to 100 kmph in 4.5s and has a top speed of 200 kmph. The crossover competes with the Tesla Model X but is priced from Rs 55 lakh (excluding taxes and duties). Waymo and Jaguar engineers will conduct on-road testing and capture real-world data to refine the technology and deliver optimum safety and reliability. This will be done from the ground up and standard I-Paces will not be retrofitted with Waymo's autonomous tech. The aim is to provide a potential one million trips per day to Waymo's self-driven ride-hailing service. This service currently uses a fleet of plug-in hybrid Chrysler Pacifica minivans and older Lexus RX SUVs. The I-Pace will be the premium offering complementing these cars and is set to make its testing as well as operational debut in Arizona, USA. The Waymo Jaguar I-Pace will be shown at the 2018 New York Auto Show. This development is a perfect example of where the car industry is headed in the future with traditional car makers and tech start-ups collaborating on projects to explore opportunities to better utilize the rapid developments in electric-car tech and autonomous mobility solutions.